where patients are anxiety-free so providers can focus on the dentistry instead of managing stressful misbehavior. The award-winning TLC Technology Lighting Center integrates digital technology with heat and glare-free operating lights to create a fun, uncluttered, and sedating environment called the TLC ZONE. Find out why 20,000 patients a day ‘zone out’ in the TLC ZONE and share their WOW experience with others who become new patients. Click on “Reviews” to read what TLC dentists are saying about the TLC and explore this website to view in-office videos and pictures of award-winning TLC practices. Call today to discover how easy it is to update your practice with the TLC Technology Lighting Center. 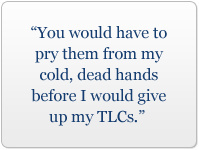 TLC—Your patients deserve it…and so do you. Remodeling? Updating? Opening a New Office? Contact us today to receive Steve Seltzer's FREE Office Design and Remodeling Report for valuable information to help you create an efficient, inviting and aesthetically pleasing practice environment. ©2009 Seltzer Institute, Inc. All rights reserved.